Cypress Hills interprovincial park, set on a high plateau, is famous for starry skies. People flock to the park by night to take in the immensity of the prairie starscape. By day, however, a keen observer might be surprised at the sight of ‘shooting stars’ of a different sort buzzing overhead: drone aircraft. One of these curious tin birds, a genuine 21st century military artifact, has just landed at the Canadian War Museum. First of all, what exactly is a drone? Also called a UAV, or Unmanned Aerial Vehicle in technical jargon, a drone is a small unmanned aircraft used for reconnaissance and the gathering and reporting of tactical information…or simply as a firing target used in anti-aircraft training. Stinger-less male bees are also known as drones, which is probably why the term was first used, tongue-in-cheek, by 1930s British military personnel to describe the Queen Bee, an unmanned version of the DH.82 Tiger Moth to be used in target practice. With its loud, buzzing engine and slow, meandering flight pattern, it seemed more like a lazy drone than an actual queen! The name stuck and has been used ever since. With time, drones have evolved from simple anti-aircraft targets to bona fide remote-controlled attack craft with the capability to deliver weapons. They are currently employed in a wide range of conflict situations as well as civilian use such as aerial search and rescue, gathering meteorological data, and relaying remote sensing information. 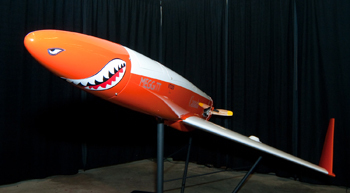 Here at home, Medicine Hat-based firm Meggitt Training Systems Canada, manufactures drones such as the Vindicator II, which is widely used by the Canadian Armed Forces as a target for anti-aircraft fire. It is also utilized in operator training for larger UAVs such as the CU-161 Sperwer. Like its insect counterpart, which dies once it has carried out its role of mating with the queen, the Vindicator II is destroyed when anti-aircraft fire successfully hits its target. Although it is based on a modular design that allows the delta wing to be replaced easily if the fuselage can be salvaged after a crash landing, it is not easy to acquire a Vindicator that has been in service. We are therefore fortunate that Meggitt Training Systems Canada generously donated a Vindicator II to the Canadian War Museum last June. This example of the first mass-produced Canadian UAV allows the museum to display and demonstrate Canadian ingenuity and know-how in the development of modern-day military technology. The small orange aircraft that was donated has a wingspan of about eight feet (2,52m) and weighs approximately 170 lbs (77.3 kg). Launched pneumatically from a portable rail, it can sustain flight for 75 to 90 minutes and achieve a maximum speed of 300 km/h. Its advanced automatic pilot system allows the Vindicator to follow a preset flight trajectory which can also be modified from the ground while sharpshooters attempt to gun it down. To date, over 500 of these UAVs have ‘fallen in combat’, a necessary sacrifice to ensure successful operations and the advancement of military technology. Set your sights on the Vindicator II, coming soon at the LeBreton gallery. With its bright orange shark face, it’s one target you just won’t miss!